This article is part of a year-long feature - watching and blogging about twenty acclaimed, cult, challenging and rare films over the course of 2013. The full list of films (and links to other completed posts) can be found here. Seven: Kubrick's historical opus Barry Lyndon. Have you ever had an overwhelming reaction to a 'great' film? One where you get completely caught up in the narrative and emotions of the work in question? Where you are drawn into an almost trance like state, and find it a tad difficult to shake off even when the lights have gone up? A film so absolutely immersive you are left in no doubt of its powerful impact on you? 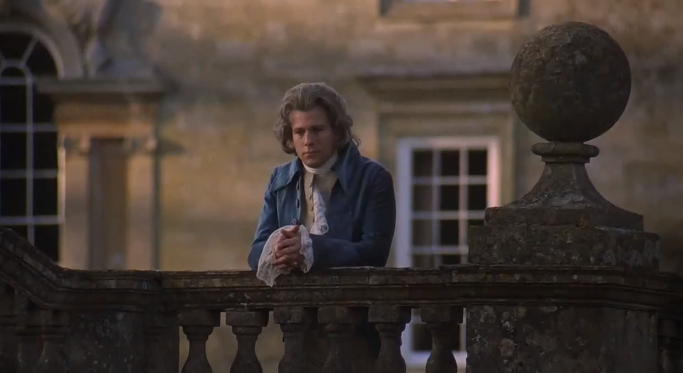 I have no doubt Barry Lyndon is a 'great' film, but unusually I didn't have the above reaction to it. Lyndon is a peculiar film, even by Kubrick's wild, rebellious standards. On one hand, it's brimming with period detail, lush cinematography, lavish locations and a generally unwavering commitment to capturing the look, feel and mood of its 18th century setting. If any one film has ever earned the adjective 'painterly'... indeed, freeze-frame any number of shots and you'd be forgiven for thinking it's an actual classical painting. John Alcott earned his place in cinematography history with his work here. A lot has been written on these observations before, particularly the startlingly effective decision to shoot the film with an emphasis on natural light, so I'm not going to dwell on them - it's almost without argument a peerless visual feast, and I say that as someone that tends to experience an inert disconnect when it comes to costume epics. Yet while Kubrick poured immense effort into creating one of the most credible period settings in the history of cinema, he also consistently goes out of our way to keep us at a distance - emotionally particularly. The story's drama is undermined by a sardonic chorus pre-empting any imminent developments & surprises - in film 'spoilers' if you will. Every time we're tempted to side with a character - such as when our protagonist eventually finds true humanity in the form of his young son - they're usually only a few minutes away from an act of extreme selfishness or some pitiful humiliation. Chronological shifts are presented like a punch-line through editing which I'd almost call witty. The individual sequences are flawlessly presented - including a duo of fumbling duels up there with Leone's timeless gunfights, or one two characters silently but sensually falling for each other across a cards' table - but diegesis is broken with casual frequency (although the lengthy film flows surprisingly well, which I wasn't expecting given its (I now realise unwarranted) reputation for being laborious). What's the purpose of all these playful shenanigans, seemingly so at odds with the painstaking efforts to craft a believable world? Kubrick's intention is for us to be removed - to intellectually critique and observe this world of hypocrites, liars, cheats, wannabes and - infrequently - generally decent human beings. It's a film of near constant cruelty; almost divine cruelty. It, for example, presents us with a definitive, absolutely unique cinematic battle scene - shot with clinical, undramatic precision, the violence is shocking in its complete pointlessness. Lyndon's journey is one of near farcical chance, near-miss and ultimately personally assured self-destruction. The film is above all blackly comedic, the lack of satisfying catharsis the ultimate punchline in the cosmic joke being told by the director. Barry Lyndon is a beautiful contradiction, so - on one hand a definitive historical epic, on the other a big, self-aware joke. Only Kubrick could pull off such a bizarre combination with such a deft hand. The film, vitally, never gets lost in its deep-rooted irony, nor does it succumb to the cheap tricks of countless other extravagant costumed pageants. With its amazing eye for detail in one hand and a lust for deconstruction in the other, Kubrick successfully achieves a very unique type of profundity. It's only long after the credits had rolled that I was able to realise that. Stanley Kubrick: the most wonderful of cheeky cinematic bastards.